With hundreds of diagnostic codes for oxygen sensors, it is no wonder technicians face a daunting task when identifying the cause (or causes) of an oxygen sensor-specific trouble code. Knowing how to accurately interpret location codes is the first step in the diagnostic process that can be used along with fuel trims and catalyst efficiency. Diagnostic trouble codes often contain location information of the sensor to be diagnosed. Abbreviations like, “B1S1” is a typical location definition in scanners. “B” indicates the bank the sensor is located on. Some vehicles can contain up to six sensors, however Bank 1 will always be closest to cylinder #1 on all engines. Bank 2 may vary by engine orientation, but a good rule of thumb is that bank 2 will be opposite of bank 1. “S” defines the sensor position on a particular bank. The lower the sensor number, the closer to the engine the sensor will be. S1 will often be between the exhaust manifold and the catalytic converter, while S2 will typically be after the catalytic converter(s). It is important to note, that depending on the manufacturer, sensor locations are the exception not the rule. For these manufactures, refer to the OEM data when troubleshooting codes. 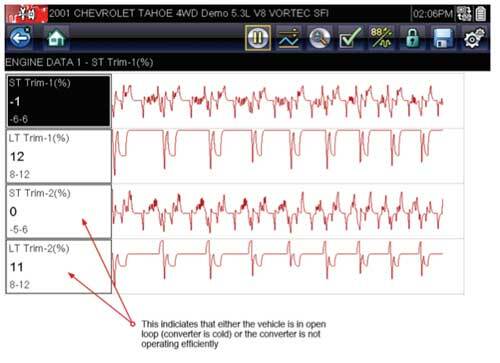 When oxygen sensor testing the vehicle should always be in closed-loop operation. The coolant temperature should be warm and the catalytic converter should have completed the monitor. In this situation, the downstream sensor should not be more active than the upstream sensor. If the downstream sensor is switching more than the upstream sensor, it could indicate a problem with the catalytic converter. Use multiple approaches when determining if the catalytic converter is the problem. Oxygen sensors also play an important role in fuel trims. Fuel trim is the ECU’s ability to add or subtract fuel (+/-). The ECU has this ability based on the oxygen sensors’ input whether to add or subtract fuel, depending on how much oxygen is present in the exhaust. Fuel trim testing is another diagnostic method in determining catalyst efficiency. There are two types of fuel trims used in vehicles today: short-term fuel trim (STFT) and long-term fuel trim (LTFT). There are two things that differentiate STFT and LTFT. Short-term fuel trim determines the quality of the air going into the catalytic converter, while long-term fuel trim is used for catalyst efficiency, closed-loop operation and setting injector pulse width. Both fuel trims are calculated from oxygen sensor input pre-and post-catalytic converter. When the ECU uses fuel trims for catalyst efficiency, it monitors the short and long-term fuel trims for +/- 10% per fuel trim. If there is a variance of more than +/-10%, this could indicate a converter issue. When diagnosing drivability concerns, there are a few situations in which fuel trim testing is not effective. For example: Deceleration Fuel Cut Off (DFCO) where fuel is automatically shut off to the engine when the vehicle is decelerating or slowing down; Wide Open Throttle (WOT), which adds extra fuel to prevent knocking and pre-ignition at high RPM; Warm-up Enrichment (WUE) or “open loop”, where extra fuel is used to warm up the convertor and engine resulting in excessive fuel trims until a closed loop is executed; and in Power Enrichment (PE) mode, when the forced induction of a turbo or supercharger adds more air, requiring more fuel. 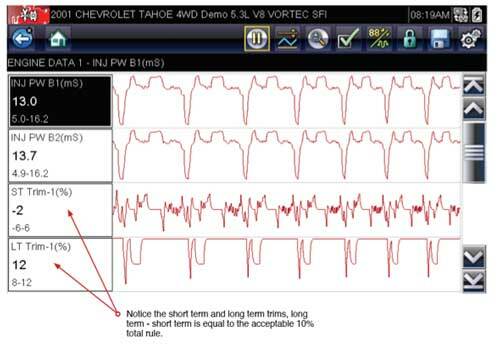 In this mode oxygen sensor inputs to the ECU are bypassed to run a rich condition. While there are many reasons for a catalyst efficiency issue, the oxygen sensors are valuable resources in determining the efficiency of a catalytic converter and further diagnosing an emissions system. 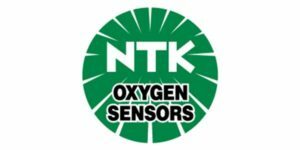 If you have questions related to emissions repairs, contact NGK Technical Support at (877) 473-6767 option #2 or visit www.ngksparkplugs.com/ntk for more information.